A: That decision will be made by each autonomous congregation in accordance with guidance from Scripture. Q: How many Baptists does it take to consecrate a woman to ordained ministry? To approve a female deacon or Sunday school teacher? As feminists in churches still controlled by men, our choices are to laugh, cry, or pray, and I find myself rotating among these options on a daily basis. Likewise, the policies of Christian churches today in regard to women are an entire banquet of laughter with new delicacies served up daily in various denominations around the world. 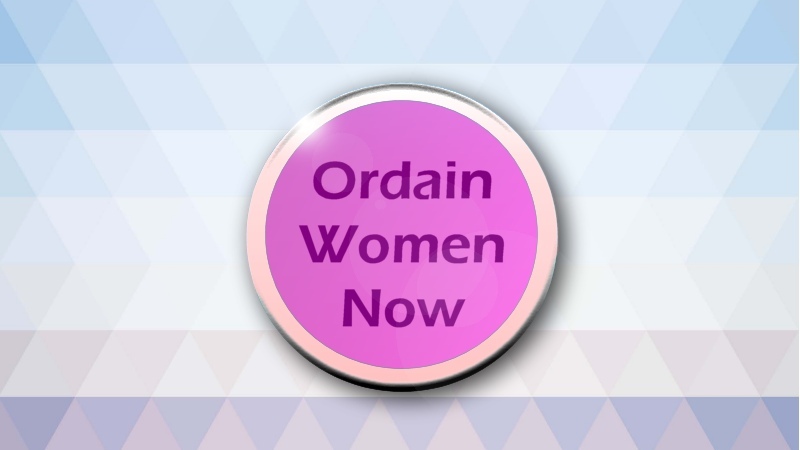 For example, two Catholic women who each wore a button saying “Equal Rites – Ordain Women” last April while serving as Eucharistic ministers in their parish in southern California received letters two days later forbidding them henceforth to serve in any ministry until they repented and promised not to wear the buttons any more. So far neither Kay Akers nor Cheryl Ortega has entered the confessional to say “Forgive me, Father, for I have sinned. I wore a button….” They and their pastor, however, along with the ministry facilitator, did work out a compromise that allows them to wear the buttons when simply attending Mass or other parish functions and also to serve at Eucharist when not wearing buttons. Meanwhile they learned that the ministry facilitator had been forbidden to speak with them during the crisis—all communication had to be in writing. The extreme caution and drama were worthy of a chapter from The Da Vinci Code: Dangerous buttons! Handle with care. This story comes from the summer 2006 issue of NewWomen, NewChurch, a publication of the Women’s Ordination Conference (WOC), a Roman Catholic advocacy group founded about the same time as EEWC. One of WOC’s creative answers to entrenched male hierarchy is the “Ministry of Irritation.” Janice Sevre-Duszynska, co-chair of this ministry, has done everything from interrupting male ordination rites to staging street dramas and picketing the US Conference of Catholic Bishops. In Rome during the Synod of Bishops of October, 2001, she led Women’s Ordination Worldwide in placing a dramatic banner across a street near the Vatican calling for women priests. Inspired by these WOC activists, I have a modest proposal. We in EEWC need to start a “Ministry of Laughter.” It would be great to designate various deserving churches for visits by a contingent of our members ready to enjoy the humor of men trying to keep a lid on women’s Spirit-led energy. One of the first congregations we need to visit is the First Baptist Church in Watertown, NY. On August 9 the church board there unanimously voted that 1 Timothy 2:12, “I do not permit a woman to teach or to have authority over a man,” should be interpreted literally for today and applied to Sunday school teachers. As a result, the church fired 81-year-old Mary Lambert from the Sunday school teaching she had been doing for more than fifty years. It retained women who agreed to teach only children or other women. The congregation is affiliated with the American Baptist Church (ABC), which supports the ordination of women, but an ABC New York State executive said that Lambert cannot appeal to a higher level of the church because all Baptist congregations are autonomous and can create their own policies (The Post-Standard, Syracuse, NY, Aug. 24). Apparently the Watertown church moved backwards on women’s leadership and other issues when a new pastor was hired two years ago. A graduate of Baptist Bible College in Springfield, Missouri, he had previously served at an independent Baptist church in Ventura, California. Independent churches have no denominational ties and thus no checks or balances whatsoever on the inclinations of a pastor and his followers. Next on our visitation list will be the First Baptist Church of Cary, North Carolina (affiliated with the Southern Baptist Convention), which voted in June, 2005, to restrict women from being deacons. Never mind that women had served in this capacity for years, and never mind that one of the women currently serving as deacon argued eloquently against the new restrictions. “Of course, we wouldn’t ask you to step down immediately,” the deacon was told by the nice young pastor whose arrival had brought a more conservative view of women. Actually, the 2002 SBC resolution urged Baptists to “resist ‘gender-neutral’ translation of Scripture.” Such translations are “inaccurate” because they erase the maleness of God and add women into the text. Who wants to be reminded about unnecessary sisters every time the apostle Paul exhorts “brethren”? But neutrality is such a positive term that this pastor in eliminating women decided to call his stance “gender neutral.” How “double-tongued” (to use the KJV)—discrimination by gender being called neutrality. It’s like the famous “War is peace” motto in George Orwell’s novel 1984. Her mother, Frances D. Chappell, is a member of the church and was invited to become a deacon there in the late 1990s before church politics shifted. Yet in 2005 she attended the congregational meeting where a hundred members were asked to vote on “he/she” or just (male) deacons by standing up. Only a handful stood up to support retaining women as deacons, but courageously 83-year-old Frances stood while good friends sitting next to her remained seated. Can a single man make the cut? What about widowers or a guy who married the life of the party? I bet just being a born-again male and not polygamous is good enough. Then there are the Catholics, who require that their deacons and priests not be married. It’s a good thing we are saved by faith, not by reason. Another example of the men-are-neutral-but-women-aren’t attitude was reported by a Methodist pastor in Phoenix, Arizona, Dottie Escobedo-Frank, speaking to the New York Times (“Clergywomen Find Hard Path to Bigger Pulpit,” 8/26/06). As part of our Ministry of Laughter, let’s all go to church next Sunday and cover our eyes if we see a buff, athletic man preaching the Gospel. Actually, we could cover our eyes for any male—or female—preaching, since temptation is in the eye of the beholder. Our sisters in Christians for Biblical Equality have thought of a good tactic for answering the rejection of the Sunday school teacher in New York. In honor of Mary Lambert’s stand, they’re holding an online book sale with 25% off on “resources that affirm the biblical basis for women teaching in the church.” Titles include Who Said Women Can’t Teach, What Paul Really Said about Women,Courage and Hope: The Stories of Ten Baptist Women Ministers, and two books devoted entirely to rethinking I Timothy 2. On the bright side, the Christian Reformed Church of North America voted this past June to remove the word “male” from its qualifications for ecclesiastical office. 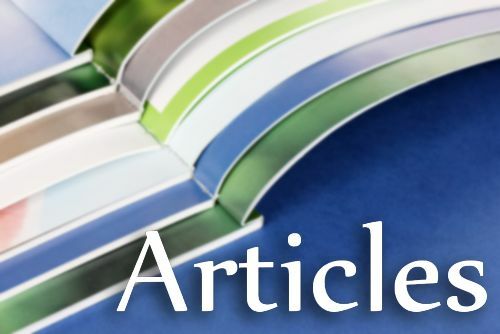 The decision, however, must be adopted again by next year’s synod before it takes effect, and for seven years women ministers and elders will not be allowed to serve as delegates to synod, in order to provide a “Sabbath rest” and preserve church unity. A Sabbath rest from justice that has already been delayed for several centuries—what a concept. But at least they’re following Scripture by waiting seven years, not five or six. What are we to make of these stumbling steps toward justice, accompanied by random but widespread instances of opposition to women? As Evon Bachaus, an early leader of EEWC, said years ago, “The action is in the reaction.” We can measure our effectiveness in working for change by noting the amount of opposition we inspire. The presence of mavericks fighting to keep women down tells us that progress for women is occurring. Young male pastors trying to legislate women out of the Sunday school and the board of deacons are like the fictional Don Quixote, who lives after the age of glorious knighthood has ended. No longer able to fight tyrants and win glory, the deluded would-be knight fights windmills. These young reactionary pastors are the Don Quixotes of today. In order to defend Scripture as they literally interpret it, they look at grandmothers serving the church and consider their presence dangerous. Taught in fundamentalist seminaries by men who themselves were trained in age-old misogyny, they earnestly set out to serve the church but end up fighting windmills. Probably the best way to handle these lovable, laughable guys is to continue standing up for women—as Mary Lambert and Frances D. Chappell have done—but also to get serious about our Ministry of Laughter.